Can hold up to 500 lbs (~226 kg) of weight per cot! The sleeping deck is quite comfortable making a mattress unnecessary. Getting a good night’s sleep when camping does not have to be a nightmare anymore. You can sleep comfortably on a camping cot similar to your bed at home. The Disc-O-Bed Cam-O-Bunk Cot with 2 Organizers offers you this exceptional comfort. It is a bunkable cot that makes it possible for two people to use the camp cot. Moreover, you can debunk the cot and use it as two separate cots, or use it as a bench when you want to sit down. Such flexibility is something you do not want to miss at the camping site. The sleeping surface of this cot is also unmatchable. It is made of polyester, which provides all the comfort you need. This cot does not have a middle bar to interrupt your sleep. The Disc-O-Bed Cam-O-Bunk Cot can also be used comfortably in extreme weather conditions. This makes it the best cot for camping as it has many advantages. Investing in it is a win-win situation as you can use it for both outdoor and indoor activities whenever you have guests. Therefore, if you want to go camping in the company of another person, do not hesitate to get a Disc-O-Bed Cam-O-Bunk Cot. Not only will it give you all the comfort you need, you shall also maximize on your camping space. Has a distance of 21 inches/53 between cots. Optional extensions are available to increase the distance between the beds. The cot has a one-year warranty against any defects related to the materials used to make the cot, or the workmanship. This is an extremely sturdy bunkable camping cot. You won’t find too many camping cots which support up to 500 lbs (~226 kg) of weight. The bunkability gives a great possibility to save space in the tent. 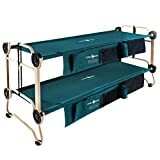 Organizers (two of them for each cot) are the perfect addition to the camping cot. Of course, you will not take this cot with you if you are hiking or backpacking. This would be simply ridiculous. However, if you are going car-camping – it is a highly recommended piece of gear to have with you.